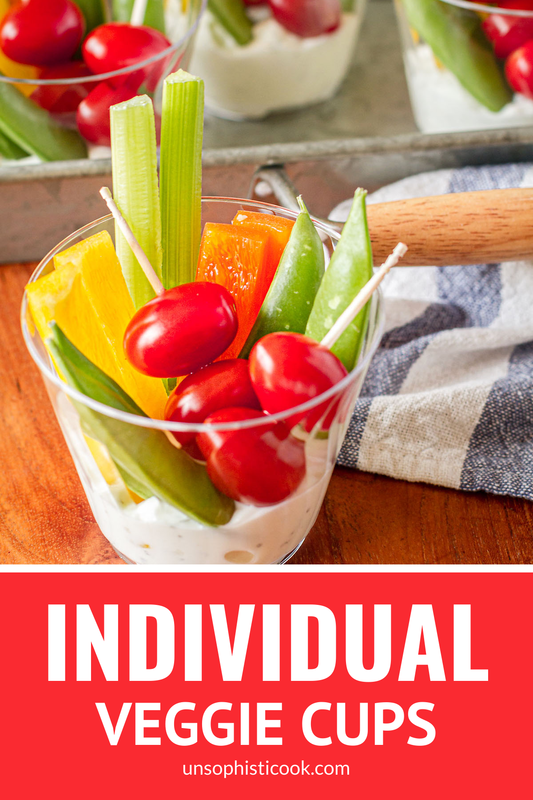 Forget the vegetable tray, these little individual veggie cups are the perfect appetizer for any occasion… Easy clean up and NO double dipping! We’re keeping things low key around our house this summer, so I’ve been talking a lot about easy summer entertaining ideas… And it doesn’t doesn’t get much easier (and cuter!) than these individual veggie cups. Need a last-minute appetizer? This will be your new go-to “recipe”! Veggie cups are super quick and easy to make, although I do have a few tips for best results and keeping them fresh. The key to a really good veggie cup is starting with a very thick dip that won’t turn runny as it warms up. My favorite is anything from Heluva Good!. Their thick and creamy French Onion dip is always a good choice, as it’s super versatile and comes in large party size containers at Walmart. But Heluva Good! also has a Buttermilk Ranch variety that would be a great choice, as well. Either way, I always make sure to pick up an extra container. My kids dip everything in Heluva Good! dips, so if I’m not careful, it will be gone before I have a chance to make my appetizers. Might as well save myself some frustration! As simple as these individual veggie cups are, I don’t recommend making them too far in advance of your occasion. The veggies can get kind of wilty and dehydrated if they’re exposed in the refrigerator without being covered (covering them loosely with plastic wrap can help prevent this). And the cups do take up quite a bit of room, which is always at a premium in our fridge. Instead, I recommend cutting up all of your veggies in advance and storing them in covered containers, then assembling your veggie cups shortly before your event. I used a colorful mixture of yellow and orange bell peppers, sugar snap peas, celery and sweet cherry tomatoes. Other choices might include: radishes, green onions, carrots, asparagus, green and black olives, or even endive lettuce. You can easily tailor these to the event, going basic or upscale depending on the occasion. Assembling the individual cups is pretty straightforward once you have your desired veggies prepped. I used some sturdy crystal cut plastic cups (high sides are essential for keeping the veggies in place), and I added two tablespoons of Heluva Good! French Onion Dip to the bottom of each. Then I simply arranged my veggies in each cup, using toothpicks to hold smaller dippers, like the cherry tomatoes. These will make eating them easier, too — no one wants dip-covered fingers from fishing out the tomatoes! Like other perishables, surrounding these individual veggie cups with ice is a really good idea on a hot summer day. Serve with chips or a platter of additional cut up veggies to finish up any remaining dip in each cup. Divide the Heluva Good! dip between 12 sturdy plastic cups, 2 tablespoons per cup. Arrange the fresh cut veggies in each cup using toothpicks to hold the cherry tomatoes in place. Cover loosely with plastic wrap until ready to serve. Surround the cups with ice if the weather is extremely hot. P.S. Sometimes we’ll change things up and use this chip dip in our veggie cups. It pairs well with both chips AND veggies! This is a sponsored conversation on behalf of Heluva Good! ; all opinions and text are my own. Find Heluva Good! bold-flavored dips in the dairy aisle of your neighborhood supermarket. Thank you for supporting the brands that support this site!